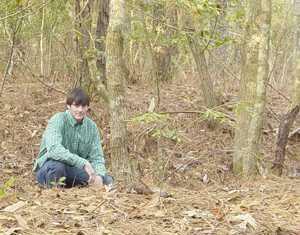 Scott Dawson squats down in the area where trenches and embankments indicate an earthern structure. Scott Dawson, a native of Hatteras Island and now a resident of Colington, has shared the location of a discovery he made on National Park Service property with that agency, which has now secured the area and posted surveillance to insure that intruders don't disturb the site. But if proven correct in his beliefs, Dawson will be the envy of many archaeologists who have spent their careers in the search of the long-lost Ft. Raleigh, Ralph Lane's 1585 fort on Roanoke Island. A call was placed to Stover by this reporter to make arrangements for Dawson to take officials to the area. Since then, the site which includes earthworks, trenches and embankments, has been visited by several interested parties, including NPS officials, head of the Lost Colony Center for Science and Research, Fred Willard and Dawson. During one of those visits, Dawson, under a permit issued by the NPS, used a metal detector and, he said, there were numerous "hits," most of which indicated silver down under the layers of dirt. "You wouldn't find this much silver at a Civil War site," said Dawson who is a Civil War historian. "What was interesting about using the metal detector is that it never registered lead or zinc, the two most common hits one gets when combing over a Civil War site, due to the bullets being made of lead or occasionally zinc." "Through careful analysis of the primary sources of the 16th century voyages," said Dawson, "I found two sentences from two separate first-hand accounts that gave me minor clues as to the location of the fort. "Later, I found vague references to the fort's location in regimental histories from various Civil War first-hand accounts. They gave me enough confidence that I narrowed the location down to one of two places. "Both places contained fresh water according to detailed maps from the 1700's. I decided to find where the fresh water sources used to be and then walk in a spiral pattern from them until I was at a radius of 100 meters. It didn't take that long. On Feb. 6, on my way to one of locations I had narrowed it down to, I found deep earthworks. I took some pictures and continued to search the area. Then I found more trenches cutting 90 degree angles at times and forming a large enclosure. "I also found large square holes as well as smaller ones that formed patterns." Dawson's primary sources for locating the site were documents written almost three centuries apart. According to Dawson, during the Civil War, the Union Army's 27th Massachusetts camped out on top of Ft. Raleigh. He obtained that information, in part, from a letter written by William Derby, a soldier in the 27th. Derby also wrote that guards were posted to keep vandals out of the area which they were told was the original Ft. Raleigh. "This is all over their [written] regimental history," said Dawson. "However, no one knew where they camped. Colonel Green, a Confederate commander in charge of the 2nd North Carolina, landed at Wiers Point at the end of the battle on Feb. 8, 1862. He arrived just in time to surrender because the fight was already over, but before he did, he had his men throw all their guns and equipment into a ravine -- most likely the one that is on Wiers Point since that is where he landed and surrendered. "On the morning of February 9th, the 27th Massachusetts found these guns, and the record says they were in a ravine close by. So I went to that ravine and looked all over the place starting with a point of land that runs out into the marsh because, in John White's account, he says that in 1590 he went to a point of land opposite Dasamonquepue, which is an Indian town in Manns Harbor. "So I went to the point of land next to the ravine south of Wiers Point. In John White's account, it never says why he went to that point of land. Only after he went there did he then round the northern tip to the settlement. Obviously, the settlement was not inside the fort or they would not have built a palisade around it. "Also in 1587, when they are looking for Grenville's 15 men, they searched for a day and then took the boat to the fort the following day. He probably went to the settlement and after [finding] no sign of the men, then went to the fort where barracks or a few more houses were. "There are lots of points of land on the Dasamonquepeu side of Roanoke, but the Civil War stuff narrowed that down for me. The presence of fresh water narrowed it down further."